Green and Gold Energy, Australia is developing the SunBall™ rooftop solar system. Incorporating a high efficiency (>30%) solar energy concentrator, an automatic dawn to dusk internal 2 axis tracking system and solar cells that are cooled by radiation to a low operating temperature. Extensive testing is being done to ensure 25+ years of life, high reliability and ease of installation. "The company's goal is to reduce the delivered cost of rooftop generated photovoltaic (PV) kWhs to below that available from the grid. Solar PV then becomes a sensible financial and logical choice for domestic and commercial electricity users." Green and Gold have completed development of a 0.4 meter diameter SunBall™ , with 42 Wp output and are proceeding with development of a 1 m2 unit with a 1.3 kWp output. 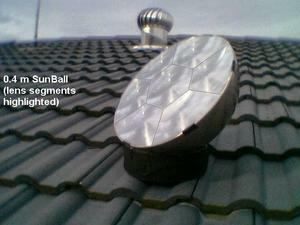 The 1 m2 SunBall™ is expected to be available early in 2006 for a price of AUS$1,613 (US$1250.) It is expected that units for export will be available by July 2006. The 0.4 meter SunBall™ suitable for battery charging, will be available at the same time. The SunBall™ uses a non reflective coated optical acrylic Fresnel lens to capture the light from an area 500 times that of the solar cell and focus it onto a triple junction solar cell. Each hexagonal shaped Fresnel lens (segment) is about 5.5 inches (13.9 cm) long on each side with the solar cell located about 7.9 inches (200 mm) beneath the lens. Each segment of the units is identical, so there is no scaling of this component required between the 7 segment 0.4 m unit and the 19 segment 1 m2 unit. The Sunball uses Spectrolab 35-38% efficiency triple junction solar cells similar to those used in the Mars rovers. The cell is attached to a large diameter heat sink which transfers the heat to the aluminum outer shell of the SunBall™ maintaining a temperature 10 oC above ambient, a lower operating temperature than is achieved in solar panels. Using "Max kWh Tracking"™ the the sun is continually tracked to ensure the best power generation. This is done by continuously searching the sky to obtain the maximum PV current. The internal microprocessor can also command an increasing spiral sky scan to find and lock onto the sun or brightest sky spot if the sun is obscured by clouds. This search capability means the SunBall™ can be quickly installed on flat or sloping roofs without regard to polar alignment, date, time, etc. The SunBall™'s 2 axis tracker is mounted internally (to reduce environmental degradation) and is designed to handle loads 5 times greater than the SunBall™ will ever encounter. Their website shows a map of the US with cost of electricity per kW for various regions. This shows a cost per kWh of $0.072 to $0.084 in the sunniest southwestern states and $0.126 to $0.168 in the upper Midwest and northeast for four 1 m2 , 1.3 Wp SunBall's at $6000 25 year life and no rebates. (the second site listed gives the cost as $6,400 plus inverter). This seems like a very straightforeward, simple, sensible design for a home rooftop unit and other moderately sized installations. Seems much less complex than the Sunflower and it can be installed on a sloped roof. Let the best unit win! Typo somewhere. On the web site I state the 0.4m unit produces 42Wp. Why not join the SunBall discussion forum? Please advise us if this sun ball is avaliable in America if not when. Furthermore, can this be used for big commercial project. Please see newer post for an update on this story. I just checked the companies website and no newer information is available. They are scheduled to start shiping units in Austrailia in February 2006. "units for export will be available by July 2006.". I don't know where they are planning to export to. Check their website for updates, which they usually make every couple of weeks. They claim their units are well made and well tested. The design is simple and good. You can install as many as you want or can afford for a commercial project. I can't get a response from the builder or information as to when it will be on the US market for sale. Has anyone purchased this product? I now see a solar cube what ever happened to the ball? Please comment on the sunball availability in pakistan market. Have you marketed the sunball? I want to be your distributer here in pakistan. Pakistan can be the best market for this product. Please send me details. I am fascinated by "Sun ball" and I would like to procure and try one.Can I get a quote? IS THE SUNBALL AVAILABLE YET? I AM INTERESTED IN DISTRIBUTION AS WELL AS PURCHASING ONE OR MORE FOR MY PERSONAL USE. IS THE SUNBALL AVAILABLE YET? I AM INTERESTED IN PURCHASING ONE OR MORE. APPARENTLY GREEN AND GOLD ENERGY HAS RUN INTO SOME PROBLEMS AS THEY ORIGINALLY FORECAST HAVING ONE READY IN EARLY 2006. I am Sr. Vice President with Entegra a public listed Renewable company from India. We are working on many RE supported projects in India. We are adding solar concentrators tharmal & electrical for our very large project but we can also test your concentrator & may use for our present project for 2 MW in India. Is it available in USA. I am interested in the economics of the Sun Ball. I'd like to know how one would calculate the fully loaded savings/benefit including installation and on-going maintenance. I' m interested for Sun Ball. I would like to have a price list and conditions about export in Europe. I'd like to sell your product. I am selling solar hot water systems and I know I can sell your product here in Toronto, Ontario, Canada. I know when you've been naughty! You want reality, not pie-in-the-sky myths? Then read on. We do have modest yield increases, not the 1,300 suns these people are claiming. And yes, we do have the figures and the data (obtained by a European University Team) to back our claims. Our company does have the tracking concentrators that effectively increase the yield to up to 60% more. And this just uses ordinary inexpensive silicon panels instead of the super expensive CPV (concentrated photovoltaic) panels. We have installed up to 4 MW in Germany, Spain, the Czech Republic, Greece, in fact all over Europe. We are also working on a tracking concentrator that increases the yield 3 times vs. the fixed installations, again using off the shelf silicon PV panels. Please get in touch with me so I can provide you with more information and pictures of our installations. Is the sun ball available in Pakistan and if not how can I get one? Interested in Sun Ball. Please provide cost and availability for Houston Texas. A very good invention for use of solar energy.Devices like these can be beneficial for charge conservation.Keep posting articles.Thanks for this posts.It is a boost for people who are working in this field. This is something that is very interesting and good.People can really learn a lot from your post.Keep sharing. It is a fable you morons. You cannot take a 1 square meter area and create 1.2 KW power output from that surface area! Look up the Wattage per square meter of the earth's surface at sea level on the equater. It is roughly 250 Watts/meter squared. No amount of concentration can increase the power output. You can only decrease the cost of solar panels, because you effectively need far less of them to produce the same power output. But the solar panel is now exposed to much higher operating temperatures, and it will fail quicker. That is why you buy expensive ones. They claim their units are well made and well tested. The design is simple and good. I would like to register my interest in your product when it becomes available in Australia. Wow..this is the first time that I've heard of this solar gadget. It looks good although, I actually think it would be better to invest in more solar panels rather than a tracker but since solar panels doesn't actually comes of as cheap this is a good alternative. I believe this and solar powered lights can actually make a great combination. Only patrics comment made a sense for me. (insolation) is 3.44 Kwh/day per sq meter,yearly avg. 35% of the above.And that what you gonna get. discount for cable& battery&inverter losses. Now that's a nifty innovation right there. I guess we can consider that as a green source of energy. When we move to Texas, I'll be looking forward to having solar power to support our house. I hope we'll be able to find someone who's going to soon sell a home. Houston, according to one blog, is one of the best metros in America anyone can live in. Doesn't that make you want to move to Houston? Anyway, I really hope we can find a good catch when we go to the real estate and ask for someone who's going to sell a house. Houston is a great city. Not to mention the great sports teams it has. We must make best use of the resources we have. Most of the common energy sources like oil have negative effects on the Earth. That innovation is amazing! Using solar energy in powering stuff up is becoming a trend these days. I've heard from some of my techie friends here in Butte County that there's actually a solar car race. Anyway, before a go far away from the topic, I hope that a lot more houses, facilities and the like would use alternate sources of powers by using this nifty innovation!